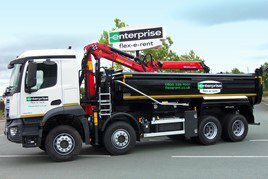 CV rental and contract hire firm Enterprise Flex-E-Rent has added three new types of truck to its hire fleet, aimed at operators working within the construction sector. The rental provider has added 32-tonne tippers, hook loaders and tipper grabs to its nationwide hire fleet, available on flexible and short-term daily rental. The specifications of the units have been carefully matched to suit companies working in building, infrastructure and highways. The hook loaders also get an electric sheeting system, and have a 22,000kg lifting capacity with a 7m body. The tipper grabs use a Palfinger Epsilon M125 Classic crane with dual controls, 5,000-litre clamshell bucket and Edbro tipper gear.